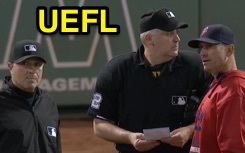 HP Umpire Bill Welke ejected Red Sox P Jean Machi for throwing at Rays batter Steven Souza Jr. in the top of the 9th inning of the Rays-Red Sox game. With one out and one on, Rays batter Asdrubal Cabrera hit a 1-1 changeup from Machi for a home run while the first pitch to Souza Jr. was located inside and shoulder high, the call was irrecusable. At the time of the ejection, the Rays were leading, 5-0. The Rays ultimately won the contest, 6-2. This is Bill Welke (52)'s fifth ejection of 2015. Bill Welke now has -1 points in the UEFL Standings (-3 Previous + 2 MLB + 0 Irrecusable Call = -1). Crew Chief John Hirschbeck now has 16 points in Crew Division (15 Previous + 1 Irrecusable = 16). This is the 209th ejection of the 2015 MLB Regular Season. This is the 94th player ejection of 2015. Prior to ejection, Machi's line was 0.0 IP, ER, HR. This is the Red Sox's 10th ejection of 2015, 2nd in the AL East (TOR 11; BOS 10; NYY 9; BAL, TB 5). This is Jean Machi's first ejection since July 9, 2014 (Angel Hernandez; QOC = Y [Balk]). This is Bill Welke's first ejection since September 9, 2015 (Bryan Price; QOC = N [Balls/Strikes]).